7CPC - EXTENSION OF BENEFITS OF REVISED PAY STRUCTURE AS PER CCS (RP) RULES 2016 TO EMPLOYEES OF AUTONOMOUS BODIES. 7CPC - Confederation Secretary General M. Krishnan appeals to all Organisations & Employees of Govt. of India Autonomous Bodies. Dear friends and comrades, As you are aware, the extensionn of benefits of revised pay structure as per CCS (RP) Rules 2016, to employees working in autonomous bodies,is still pending. There is total uncertainty regarding grant of 7th CPC benefits. 7CPC - ALLOWANCES RELATED NORTH-EASTERN & ANDAMAN NICOBAR ISLANDS. M. Krishnan, Secretary General, Confederation & Standing Committee Member, National Council, JCM writes letter to the Secretary Ministry of Finance, Department of Expenditure, Government of India & Chairman, Committee on Allowances, North Block, New Delhi - 110001 on the issue of allowances related to North-Eastern Region and Andaman Nicobar Islands. 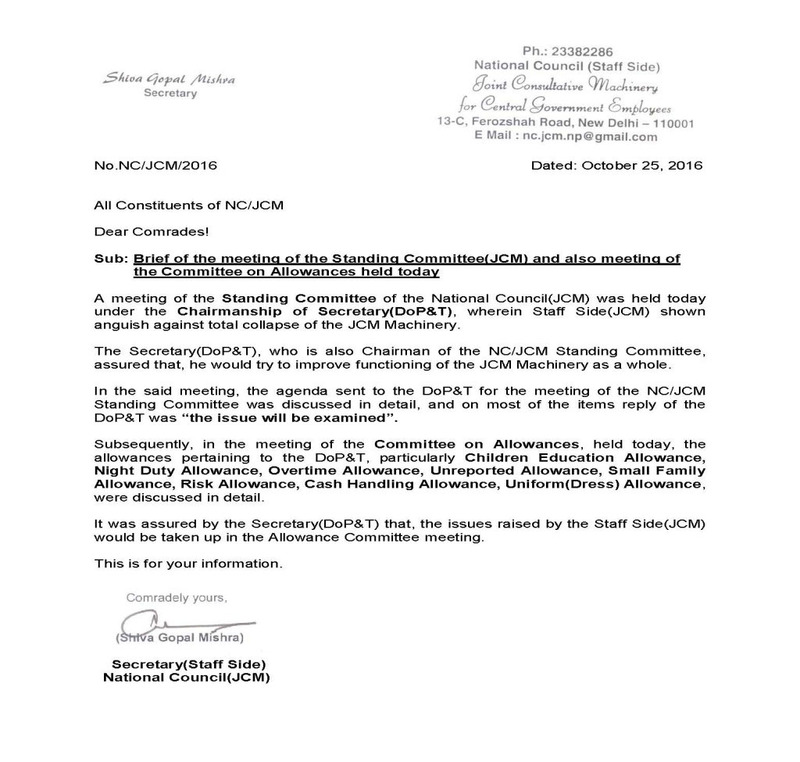 CIRCULAR DATED 26TH OCTOBER 2016 * REVISION OF MINIMUM PAY AND FITMENT FORMULA * 2ND MEETING OF THE GROUP OF SENIOR OFFICERS WITH JCM (NC) STAFF SIDE * DISAPPOINTING * 2nd Meetings of the Group of Senior Officers (Constituted as per the assurance given by Group of Minister to NJCA) to discuss the grievances arising out of recommendations related to 7th Central Pay Commission, was held with JCM (NC) staff side on 24.10.2016 at 4 PM. The staff side explained in detail the justification for modification in the minimum pay and fitment formula, which was already explained in the memorandum submitted to Cabinet Secretary on 10th December 2015 and also in the presentation made before Joint Secretary Implementation Cell and Empowered Committee of Secretaries headed by Cabinet Secretary. 7CPC Allowances issue - Brief of the meeting of the Standing Committee(JCM) and also meeting of the Committee on Allowances held today. Brief of the meeting of the Standing Committee(JCM) and also meeting of the Committee on Allowances held today. No. NC/JCM/2016 dated October 25, 2016. To All Constituents of NC/JCM - Dear Comrades! 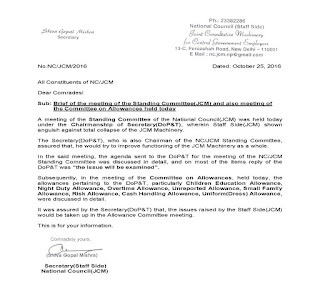 - A meeting of the Standing Committee of the National Council(JCM) was held today under the Chairmanship of Secretary(DoP&T), wherein Staff Side(JCM) shown anguish against total collapse of the JCM Machinery. 7th CPC - Revisionof Pay Scales amendment of service rules/recruitment rules. Grievances arising out of recommendations related to 7th CPC: Second meeting on today i.e. 24th Oct, 2016. Secretary, NC(Staff Side)JCM writes letter to the Secretary, Government of India,Ministry of Finance, Department of Expenditure,North Block,New Delhi – 110001 for Grant of PLB & Non-PLB adhoc Bonus to casual/ contingent workers for the year 2014-15 & 2015-1. GRANT OF DEARNESS ALLOWANCE WEF 1.7.2016 - REG. Reservation in Promotion: Corrigendum to DOPT’s OM of even number dated 30.09.2016 on subject Contempt petition (C) NO-314/2016 in SLP (C) N,o.4831/2012-Samta Andolan Samiti through its President vs. Sanjay Kothari & Ors. Central Government warns employees against criticising policies. The Centre has warned employees of disciplinary action if they indulge in criticism of the government or its policies. The move comes after officers of Indian Revenue Service (Customs and Central Excise) and All India Association of Central Excise Gazetted Executive Officers, among others, suggested changes in Goods and Services Tax Network (GSTN), a private company tasked with creating information technology infrastructure for the goods and services tax (GST), and composition of Revenue Secretary-led GST council secretariat. Recommendations of Seventh CPC with regard to EDP Cadre: DoPT seeks information from Ministry Department. No.Misc-14017/14/2016-Estt. (RR),Government of India,Ministry of Personnel P.G & pensions, Department of Personnel and Training, North Block, New Delhi, dated 17th Oct, 2016. RTI - uploading of RTI replies on the respective websites of Ministries/Departments. Uploading of RTI repllies on the respective websites of Ministries/Departments. F.No. 1/1/2013-IR, Governement of India, Ministry of Personnel, Public Grievances and Pensions, Department of Personnel and Training, North Block, New Delhi, Office Memorandum dated 7th October, 2016. Rates of Additional Dearness Allowance per mensem from 1-8-85 to 31-12-85 vide Government of India, Ministry of Finance, O.M. No. 13017/1/86-E. II (B), dated 15-1-1986. Rates of Additional Dearness Allowance per mensem from 1-5-85 to 31-7-85 vide Government of India, Ministry of Finance, O.M. No. 13017/1/85-E. II (B), dated 2-9-1985. Rates of Additional Dearness Allowance per mensem from 1-1-85 to 30-4-85 vide Government of India, Ministry of Finance, O.M. No. 13017/1/85-E. II (B), dated 30-4-1985. Paste your document hereRates of Additional Dearness Allowance per mensem from 1-8-84 to 31-12-84 vide Government of India, Ministry of Finance, O.M. No. 13017/1/85-E. II (B), dated 19-1-1985. Rates of Additional Dearness Allowance per mensem from 1-1-84 to 31-7-84 vide Government of India, Ministry of Finance, O.M. No. 13017/1/84-E. II (B), dated 15-9-1984. Rates of Additional Dearness Allowance per mensem from 1-8-83 to 31-12-83 vide Government of India, Ministry of Finance, O.M. No. 13017/1/84-E. II (B), dated 21-5-1984 and corrigendum dated 25-5-1984.